Poul Hundevad. Mid-Century Modern. Local pick up is always available in Lodi, CA. Total height: 23 1/2" tall x 31" x 21" wide - total width extended 63". Our goal is to send zero waste to landfills, of the thousands of textiles & goods that people throw away every year, as much.as 95% could be re-worn or recycled or re-used. Well made and set on thick rolling casters. Perfect for the avid mid century modern MCM collector. Gold tone very heavy and sturdy. Rolls Great. Trays are heavy duty. Bottle caddy on bottom shelf. Foldable bar that is in perfect condition. No scratches or marks. I will take best offered as well. Never used. Shipped with USPS Priority Mail. Antique Copper powder-coated finish with Rosewood Stained Rubberwood. Accommodates wine bottles, wine glasses, and other barware and serveware – it holds everything necessary for a portable bar. Wine Bottle Storage Included: Yes. Removable Serving Tray: No. Towel Bar Included: Yes. Shelf: 11" H x 13.5" W x 15" D. Stemware Storage Included: Yes. Finish: Cappuccino brown. Here at The Clearance Castle, we search far and wide to bring you the most amazing selection of products. VTG Mid Century Grain-ware Lucite Wagon Serving Catering Display. Condition is Used. Shipped with usps parcel select . Beautiful piece ! In excellent vintage condition..no fogging or crazing a few minor scratches here or there but it looks barely used ... the cart consists of 4 pieces ... ice tray, triple divided serving tray and dome cover .., it’s quite fun and will delight your guests! Please see photos for additional details and description..
All-weather wicker. Adjustable middle shelf. box opened to verify contents. Actual pictured item. Includes all original contents. As seen in photo # 10, it conveniently folds up for storage. The glass holders are built in underneath the wood top to ease your glass handling while serving your guests. Attached wheels allow for easy transport from room to room. Finish: Bronze Finish. Furniture Room: Bar. Original Joe Colombo ROBO ABS container storage in black on wheels. We love fishing. Float your drinks, cooler, snack bag, 1.75L bottles, umbrella, and anything else you can think of right next to you while in the water! No more going back to the boat, getting out of the pool, or having to walk back to your cooler on the beach. Color: Clear; Material: Acrylic; Size: 30" H X 22" L X 18" W; You Get 1; Made In Taiwan. Material: Acrylic. Size: 30" H X 22" L X 18" W. Color: Clear. 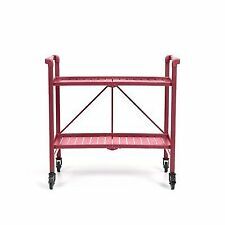 Original Joe Colombo ROBO ABS container storage in red on wheels. TRAY AREA APPROX 15 1/2" X 25 1/4" STANDING APPROX 29" TALL. REVIEW PICTURES TO ASSIST IN RE-ASSEMBLING. 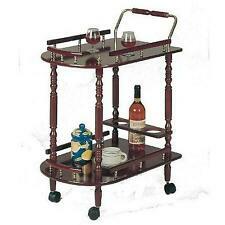 Practical and stylish drinks trolley perfect for serving your favourite beverages both indoors and outdoors. It's designed with two wheels on one end and the opposite feet have been left flat to ensure the trolley stays in firm position. Superbe desserte en rotin pour apéro datant des année 1950, 60 en parfait état d'époque. Guard rails around top and lower shelf. Iron and tempered glass construction. Bottom shelf features 4 wine-bottle rings for storage. Mirrored lower shelf. Gold hand-painted finish. Adding to its appeal, it is uniquely finished in dark tempered glass on the top and base racks for a modern touch. Key Features Features stunning Black tempered glass top and base. We PROMISE we can make you happy if you give us a fair chance. The top shelf is clear, tempered, 5mm glass and the bottom shelf is a mirror. Two handles make it easy to maneuver. Two of the four casters lock to keep it from rolling once it is in place. Clear Tempered Glass Shelf: 22"W x 17"D x 5mm. Construction Material: Fir wood, engineered wood and iron. Holds up to 10 bottles of wine. Removable serving tray. Serving tray - 2.5" H x 13.5" D. Shelf - 6.5" H x 26.5" W x 14.5" D. Here at The Clearance Castle, we search far and wide to bring you the most amazing selection of products. Elegant gold marble and cherry finish. 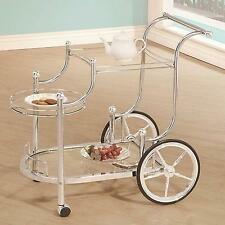 Great for serving tea, wine or just another end table. Here at The Clearance Castle, we search far and wide to bring you the most amazing selection of products. 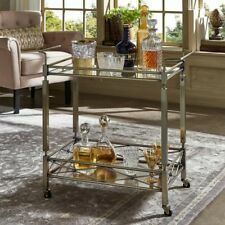 Rolling Bar Cart Anticque-Brass Wood &, Glass. Condition is New. Shipped with FedEx Ground or FedEx Home Delivery. Miniature Size. It has rubber wheels. Surrounding rails on top 2 shelves keep drinks in place. 2 upper glass shelves with bottom mirror shelf. Modern and elegant style. Designed with versatility in mind, the removable top tray doubles as a serving tray. Bottom bin provides ample storage and middle shelf includes two stemware racks for your favorite glasses. Includes four 360-degree swivel casters (two locking). 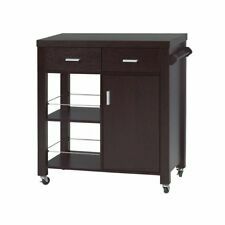 Elegant casters allow the host to maneuver through cliques of friends, while a working wheel brake adds stability. Whether in the parlor or around the pool, the Julep makes it a breeze to keep the party moving. Floor sample with very minor wear.